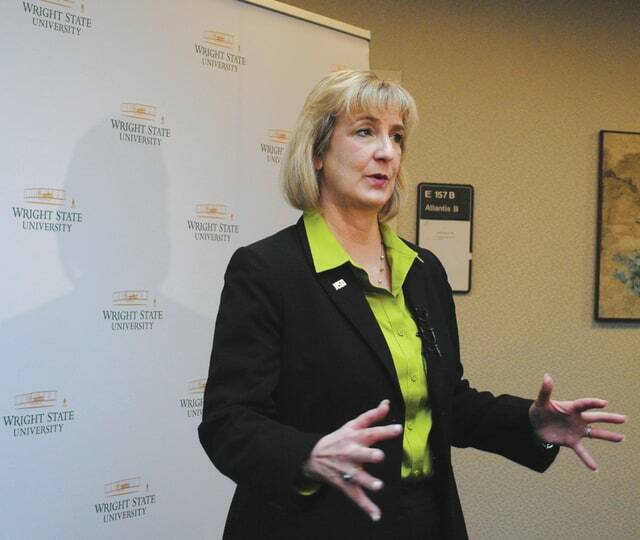 FAIRBORN — Cheryl Schrader Ph.D was chocen Wright State University’s next president Monday, March 6. Officials announced the choice during a press conference in the morning. Cheryl Schrader is currently chancellor of Missouri University of Science and Technology. Schrader visited Wright State University campus on Feb. 9 and was the third candidate for the school’s presidential position. The other candidates included: Chancellor Dennis Shields who withdrew in February and Chancellor Deborah Ford of the University of Wisconsin-Parkside. During her visit to WSU Schrader highlighted what attracts her to the college. Schrader began serving in 2012 as the chancellor of Missouri University of Science and Technology. She formerly served as associate vice president for strategic research initiatives at Boise State as well as the dean of the College of Engineering at Boise State University and held several positions at The University of Texas at San Antonio, including associate dean for graduate studies and research for the College of Engineering and the College of Sciences. She praised Wright State’s research capabilities, and highlighted her appreciation for its proximity to Wright-Patterson Air Force Base and the Air Force Research Lab. Wright State’s current president, Dr. David Hopkins, announced his retirement May 2, 2016, saying he would step down when his contract expires at the conclusion of June this year. The school went to work finding his replacement in the following months, forming a search committee that includes 21 individuals, in addition to hiring Academic Search, a specialized search firm, to assist in the process. Whitney Vickers | Greene County News Cheryl Shrader, Ph.D, made her rounds throughout the Wright State University Dayton and Lake campuses Feb. 7-9, visiting with students, faculty and staff members as well as community and Wright State officials. She is the third and final candidate for the school’s presidential position. Wright State is expected to make a decision within the early spring months. http://aimmedianetwork.com/wp-content/uploads/sites/50/2017/03/web1_DSC_0088.jpgWhitney Vickers | Greene County News Cheryl Shrader, Ph.D, made her rounds throughout the Wright State University Dayton and Lake campuses Feb. 7-9, visiting with students, faculty and staff members as well as community and Wright State officials. She is the third and final candidate for the school’s presidential position. Wright State is expected to make a decision within the early spring months. Fairborn Daily Herald news report.